New Zealander Grant Bradburn is the new head coach of Scotland. The 47-year-old replaces Pete Steindl who left the post in December after failing to reach the World Twenty20. Interim coaches Craig Wright and Paul Collingwood then helped secure 2015 World Cup qualification, before the latter took up a role with England. Former Scotland captain Wright will assist Bradburn, who is leaving his post with New Zealand A which followed five years with Northern Districts. Wright will also take charge of Cricket Scotland's elite player development programme. Bradburn, who played seven Tests for the Black Caps, will attend a media conference on 6 May in Edinburgh. He will be in Scotland for two weeks to meet the players and support staff and attend the one day international against England in Aberdeen on 9 May, with Wright in charge. He will also attend an ICC seminar being held in Scotland for the four World Cup qualifiers. Bradburn will then return to New Zealand before returning to take up his position full time on 1 July. He told the Cricket Scotland website: "I am thrilled at the prospect of working with a nation trying so hard to build on recent success. "As a coach, this presents a great opportunity to add value, by driving continual improvement, building depth with healthy competition for Scottish representation. The Scotland team have performed well by qualifying for the 2015 World Cup which will be played in New Zealand and Australia at venues that I am very familiar with. "With my appointment through to the end of 2017, I will focus sharply on continuing Scotland's progress towards being a leading force in world cricket. "I am also motivated to contribute to Scotland Cricket's overall performance systems, aligning with each region to build clear player pathways and assisting more Scottish players to step up onto the world stage." Cricket Scotland chief executive Roddy Smith believes Bradburn is the right man for the job. "Grant fitted the profile. He played Test cricket for New Zealand and when he went into coaching he coached one of their first class teams, Northern District, and very successfully. They won four day and one day titles, and he then went on to coach New Zealand A," said Smith. Cricket Scotland have also increased Andy Tennant's responsibilities from his former head of performance role to a new director of cricket position, who Bradburn will report directly to. 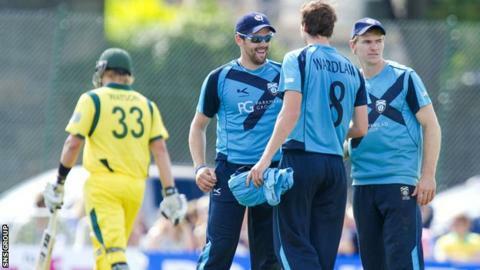 Cricket Scotland has set targets for reaching the top 10 rankings in one-day and Twenty20 international cricket.